This caused when a user account is stolen, then all messages will be stolen anyway. According to the picture above, there is no encrypted email when the messages arrived in recipient’s mailbox. The second problem is that they put an option to encrypt or not encrypt the messages. Here there are two problems. Because they offer security services, they should not give that option. Because when we talk about security as an option, then the security options will not be selected by the users. So this option should be removed. Encryption will be mandatory, not optional. Therefore messages that have been sent is encrypted automatically. An another related to second problem are they send those messages that were encrypted along with the key via email. It is not justified because if an attacker can open an email victim then the attacker will also be able to get all the messages. Actually, the message is a message that is encrypted but when the delivery is not inserted into the recipient’s mail inbox. They simply notifying the user that there is a person who sends the message, but the message can only be opened on their server (ProtonMail) with a link that has been attached and password (hint). When I was dealing with clients to exchange confidential information, I strongly avoid this issue because it is very crucial when I send an encrypted message along with the key in it. So another method I use is to separate the delivery of key and messages. Although hint just suggest or indicate something indirectly or covertly, it can be figured out by the attacker. So what happens when an attacker gains access to proton mail? Because ProtonMail directly decrypt the encrypted messages, the attacker will get all the messages whether in the inbox, sent items, trash, draft and so forth. This happens because ProtonMail makes the data turn into clear text when it arrived at the destination also in their sent items. Encrypted data only occurs in transmission from their server to the client browser. Let’s talk about OpenPGP. 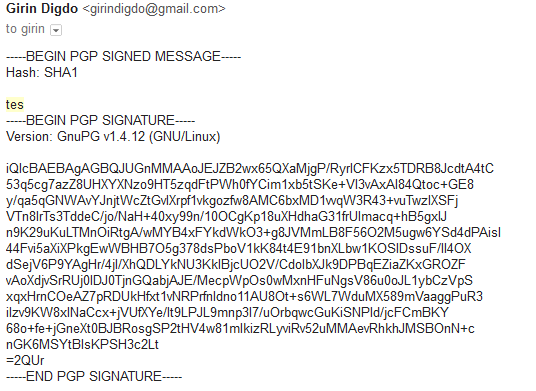 OpenPGP will encrypt all messages end-to-end encryption. If an attacker gains access to the victim’s email, then he will not be able to read the email because it’s encrypted. I has made the simple comparison between ProtonMail and OpenPGP. This comparison base on my view.